The 2011 Bullion Silver Eagle continues a series of Congressionally authorized coins started by the United States Mint in 1986. These bullion coins are typically available for purchase by the Mint’s network of authorized purchasers beginning in the first few weeks of the year and available throughout most of the remainder of the year as they are produced to meet demand. In fact, the 2011 Silver Eagle was issued by the US Mint beginning on January 3, 2011. Many records were established by the 2011 bullion Eagles including several monthly achievements, however, the biggest news was probably the fact that the 2011 Bullion Silver Eagles attained the annual sales record by October. Each of the American Silver Eagle coins are composed from one ounce of 99.9% pure silver and are considered the official silver bullion coin of the United States. Accordingly, the US government guarantees each Eagle’s content, weight and purity. That and their availability has led them to become the leading precious metal investment coin product world-wide. The Silver Eagles were originally authorized by the Liberty Coin Act of 1985 and have since been produced by the millions annually to fulfill demand by investors seeking a convenient and cost-effective way to add a small amounts of physical silver to their investment portfolios. The bullion coins have a legal tender face value of $1, but their true value is based on the content of the one ounce of silver that is contained within each strike. It is for this reason that the US Mint originally sells each coin through its network of authorized purchasers. This network obtains the coins in bulk from the Mint for an amount equal to the current market value of the silver in the strikes, plus a small premium added per coin to cover the Mint’s production and distribution costs. Then, the network resells them to other coin dealers, precious metals providers and the public for a price based on the market value at the time, keeping the cost of each coin in line with the current value of the silver that it contains. Found on the obverse of the Silver Eagles is Adolph A. Weinman’s “Walking Liberty” design. This version of Liberty was first used on the half dollar circulating coin in 1916 and is considered by many to be one of the most beautiful to ever grace a coin of the United States. The reverse shows a heraldic Eagle with shield and was designed by United States Mint sculptor/engraver John Mercanti. Both of these design have remained unchanged on the Eagle since the coins introduction in 1986, except for the date on the obverse. 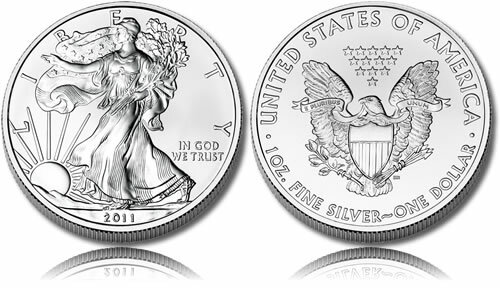 The United States Mint also produces Silver Eagles for collectors, typically in both proof and uncirculated condition. The numismatic Eagles have a mintmark which the bullion strikes lack making them easy to identify from one another.